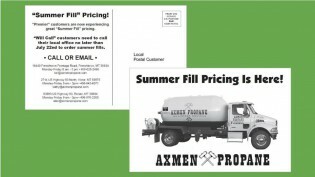 This is the first of a three-part post in which I will explain how to do a Summer-Fill Direct Mail Campaign that can be used to increase your customer base and ultimately sell more propane. I’ll give you all the information you’ll need to create your own campaign, but if you have questions or want more information, feel free to comment on the post, email or call. There is no charge and there isn’t a catch. We seriously want to help you sell more propane. Sound good? Then, let’s get started! Prior to joining the Alliance Truck & Tank team, I owned and operated a printing franchise that served the marketing needs of many small businesses in our town. We specialized in direct mail marketing – creating and managing hundreds of campaigns for customers over a 10-year period. Over the years, I’ve personally used direct mail countless times to market my own business’ services to the community. Even with many new forms of digital marketing capabilities now available, direct mail marketing is still viewed as an important component of an overall business marketing toolkit. It has been said that it takes at least seven marketing touches before a prospect acknowledges your calls to action. In today’s data and information filled world, experts say that number may have increased to 12, 15 or even 20 touches! The bottom line is that you need multiple marketing vehicles coming from many sources to finally achieve that breakthrough and acquire a new customer. Print media, radio/TV, email marketing, social media, direct mail, trade shows, web marketing and other tactics all have a place and should work together to help you achieve your desired marketing goals. It’s Targeted – Mass advertising (TV, print, radio, etc.) can be expensive and sometimes isn’t a viable option for small businesses. But direct mail can focus in on a specific geographic area or select list of very targeted individuals who are more likely to respond to your relevant offer. In terms of revenue dollars generated for every dollar spent, no form of advertising is as efficient as direct mail marketing. It’s Measurable – Direct mail is one of the few media channels that gives you the ability to accurately track the success of your campaign. It’s as simple as counting the inquiries you received or counting the number of coupons redeemed. By tracking and analyzing your results, you’ll see what’s working and can then build upon it for future mailings. It Has Higher Open Rates – Using email marketing, you might be very happy with a 20% open rate, but that means 80% of the people on your list didn’t even read your message. According to the U.S. Postal Service, 98 percent of consumers bring in their mail the day it’s delivered, and 77 percent sort through it immediately. This means there are people who could be seeing your direct mail marketing campaign immediately who could potentially come looking for your business. And since customers can also physically touch a piece of mail, they are more likely to see its contents as reliable. Click here for a more complete list of the benefits of direct mail. In the next two installments of this three-part series, we’ll discuss why it’s important to Determine Your Objective for the direct mail campaign, how to Design and Print Your Marketing Piece, and the steps involved to Prepare Your Piece for Mailing.